The Florida Everglades spread over 2 million acres not far from the hustle and bustle of busy cities such as Miami, Orlando and Fort Lauderdale. Guests to the area can observe the natural plant and animal life of this area by visiting Everglades National Park. This area contains a variety of plants and trees that thrive in its wetland habitat. Saw grass, sometimes referred to as Everglades river grass, is one plant that can be found in the Florida Everglades. This plant can grow up to 9 feet in height and has sharp, coarse leaves that resemble the blades of a saw. Saw grass has thick, underground stems that can block the flow of water. Various animals native to the Everglades utilize this plant for shelter as well as a source for food. Bladderwort is a free-floating plant that can be found on the surface of the waters of the Everglades. This plant has pale-yellow flowers that bloom on stems that shoot up over the water’s surface. Bladderwort prefers to make its home in calm, shallow waters. This plant gains sustenance by feeding on small aquatic creatures. It uses small bladders, present on the leaves, to capture and digest these creatures. Bald cypresses are one type of tree that can be found in the Florida Everglades. 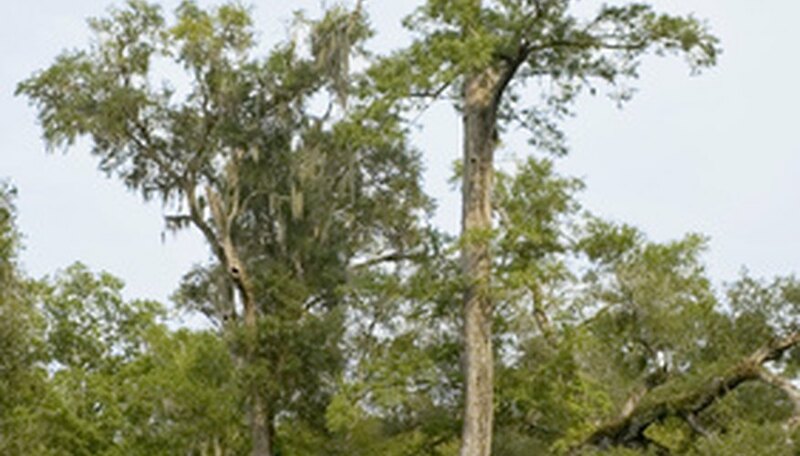 This type of tree is strong, resilient and has been able to adapt to survive in wet areas, such as the Louisiana bayous, and also in the Everglades. One example of such adaptations is “cypress knees”, or odd growths, that rise above the water’s surface. These growths are believed to allow the tree to receive the necessary oxygen to sustain life in wet areas. Bald cypress trees are also able to adapt to the other extreme and grow in dry areas. Mangroves possess the unique ability to thrive in salt water. The root system of these plants acts as somewhat of a filter, taking the needed nutrients from the water and discarding the harmful salts. There are four types of mangroves found in Florida. Red mangroves have prop roots, which are tall and can be seen arching up out of the water. Black mangroves have a dark, almost black bark and bloom white flowers in the early summer. White mangroves can have prop roots, like red mangroves, and also have rounded leaves. Buttonwood is a mangrove tree that produces small, cone shaped fruits that are reddish in color. All types of mangroves serve as a food source for aquatic wildlife.